The headline for this quarter is that the Condominiums in Dolphin Cay continue to price out at over $304 per square foot for the 12-months ending September 30, 2018 and that there have been 24 condominiums sold year-to-date, the second highest number of sales through September YTD in the past 6 years. If you missed the June 2018 newsletter, this is the first time in over 10-years that the average price per square foot in Dolphin Cay has exceeded $300.00. This is all great news for the value of condominiums in Dolphin Cay. 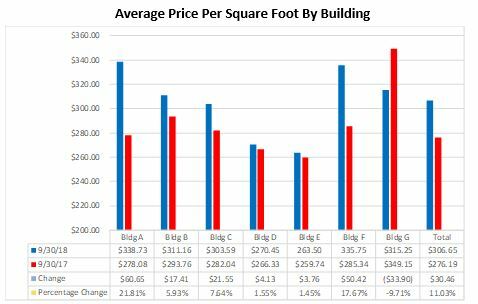 The chart below tracks the rolling 12-month average of the Sales prices on a per square foot basis for all of Dolphin Cay. The last quarter of 2018 is off to a swift start as well. There are currently 4 condominium sales under contract for sale and another 3 still listed for sale. But we still have a way to go to achieve the 34 units sold in 2013. The takeaways are (1) that Demand for Dolphin Cay Condominiums is high and (2) with low inventory of condominiums in Dolphin Cay specifically and along the Pinellas Bayway and Pinellas Beaches, generally. This is a great time to be selling your condominium as it is a seller’s market. 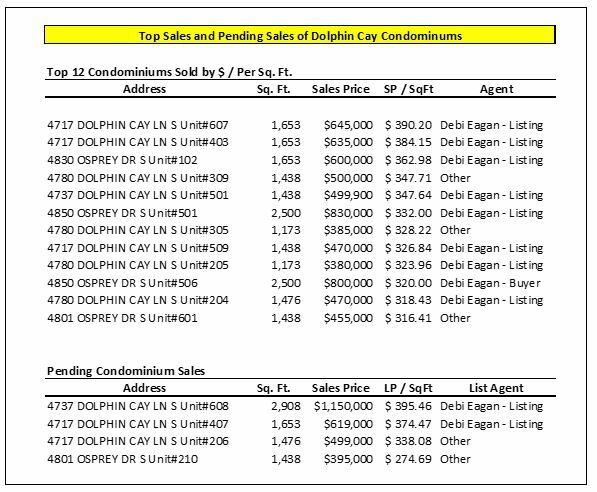 You can see in the chart at the top of page 2, that apart from Dominica and Eleuthera, that average prices per square foot in the individual Dolphin Cay condominium buildings are over $300 per square foot. It should be noted that all the buildings have had individual sales above the $300+ per square foot price point and that Dominica has only had one property sold in the last 12 months. All buildings have shown increases in their average sales price, except Guadeloupe. However, Guadeloupe prices remain strong. All of this reinforces the premise that well-maintained properties with views will always be in demand and achieve higher price points. Overall market conditions along the Pinellas Bayway, Tierra Verde and the Pinellas Beaches remains very strong. Inventories of updated condominiums is very low and exceptional properties are selling quickly as the demand for these properties far outweighs the supply. Additionally, the current rising mortgage rates does not appear to have significantly impacted the sales in Dolphin Cay, as for the last year 50% of the condominium sales in Dolphin Cay have been cash sales. These cash sales provide stability to Dolphin Cay pricing and to the community. 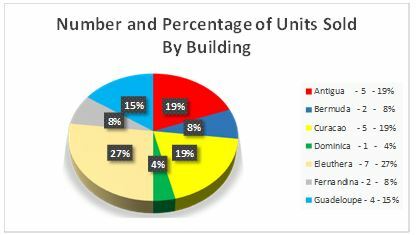 Below is a chart that displays the share of the overall sales by Dolphin Cay building for the past 12 months. Please contact me if you are interested in listing your property or if you know someone interested in purchasing a property in Dolphin Cay or the communities around us. Through highly customized marketing, an energetic work ethic, unequalled customer service, I would love to show you how Eagan Luxury Real Estate can make a difference for you. Contact me for a complimentary consultation on the value of your property or to assist with your next purchase. Visit my website at www.EaganLuxury.com for more information about many of the communities in south Pinellas County. Visit www.Dolphin-Cay.com for more on Dolphin Cay.